It’s November 13 and today, we can expect a bunch of Android related news owing to the release of several new Google products such as the Google Nexus 4 smartphone and the Nexus 10 tablet. One of the best thing about these devices is that they’ll be coming pre-loaded with Android 4.2, an update to Jelly Bean and the latest version of Android. But what if you’re not picking up the Google Nexus 4 or the Nexus 10? Will you have to wait long for the update? The answer, fortunately, is no… At least for owners of the GSM version of the Galaxy Nexus. Lock screen widgets:Customize your lock screen with widgets that let you see your calendar and email, recognize music with Sound Search and more. Third-party developers can make widgets, too. Capture the moment by unlocking directly to your camera for quick photos. Multi-user support:Share your tablet with friends and family, with separate customizable spaces for each person. Just turn on your tablet and tap your photo to sign in to your own homescreen, apps, email, photos and storage. Customizing your home screen is easy. Choose a wallpaper, add favorite apps and games from Google Play, create folders and arrange beautiful widgets just the way you like them – it’s as easy as drag and drop. We’ll keep our ear on the ground for any new information regarding Android 4.2 release updates and be sure to share them with you as soon as they’re available. 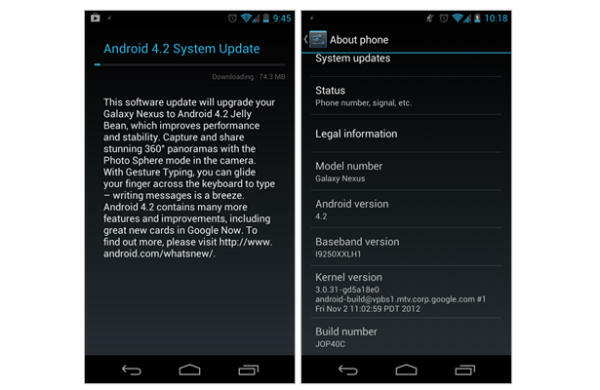 Galaxy Nexus owners, aren’t you glad that you’re getting the Android 4.2 update early without having to go out and buy a Google Nexus 4 or Nexus 10? Share your thoughts in the comments below!